Interfacing with the Touch Screen, each Motion Control board serves as the brains behind your Motion Control application. 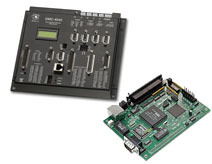 Interpreting input from encoders, scanners, and servos, the full line of Galil Motion Control boards can handle any industrial controls application. Featuring Custom EMP Software, each Motion Control board is developed specifically for your application. Whether it be Camming, Indexing, Continuous Rotary, or any other motion profile, EMP can develop the solution you need. Non-volatile memory for programs, variables and arrays. Concurrent execution of four programs. Standard power input is +/-12V and 5V. Controller available with optional DC-DC converter with 9-48VDC single supply input. (Option for 20-80 VDC).